I'm not sure if it's part of the official documentation to VMware Server, but seeing as a few people failed to connect to their VMware Server 2.x using Infrastructure Client, I thought I'd explain how exactly this can be done. Web-based administration on VMware Server is awfully slow. I must admit it got better in 2.x betas of the server, but web-based management is still far from anything really comfortable. Infrastructure Client seems visibly faster. Common management interface – Infrastructure Client provides a common interface to manage all your virtual environments, regardless of the VMware virtualization platform supporting them – can be ESX/ESXi or VMware Server. Access to a full range of configuration parameters – last time I checked, web interface only covered the most used options of managing your VMware Server and VMs. Infrastructure Client is bound to give you access to all the features available, not just the basic ones. … they get connection refused error and give up. That's it, hope this quick tip helps you! Thank you for a brilliant tip. I've actually never thought of adding the port address behind the servers IP-address. At the moment I'm running VMware ESXi instead on my home server booting from USB. After some modifications I was able to use the machines SATA-controller to add a local datastore. Thanks for a comment and for sharing a link, I'll follow your blog from now on! Another big thank you from me. The web client is painfully slow. Now I'm wondering if there's a way to use the VMWare Converter to connect directly to a VMWare Server host? I haven't used VMware Converter lately so wouldn't know the answer yet, but see no reason why this would be impossible. 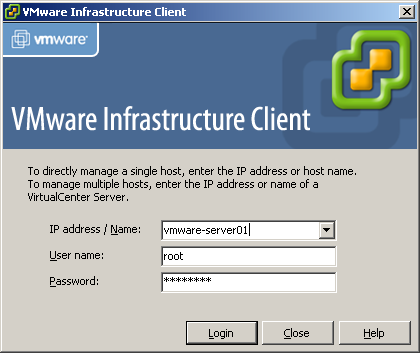 A VMware Server host is nothing but a Windows or Linux OS, so it should be easily convertable. This didn't work for me, so I tried https://server:8333 instead of just server:8333 and it worked. Thanks! Irregardless is not a word, thanks for the great tip! I can not find The VMware Infrastructure Client to download. Any hints please? Thank you for your post. In the back of my mind I wondered. Your post gave me the motivation I needed! 🙂 ip:8333 worked for me. vmware infrastructure client could not establish a connection with server "192.168.254.99". Details: The server closed the connection. — re-read the (correct) log and noticed the 'App' service was reporting problems with the /usr/lib/vmware/settings. I'm traing with vSphare Client 4.1 (last version) to conect VMware Server 2 (last version) and say that I should update my client software. Why? With a completely fresh install of vSphere Client there is a step missing, there are special client files you need to install. See link below. same prob here, using vSphere, it tries to download something from the vServer which is not available (404). how can i get the VI Client if I use the free vServer 2.0?